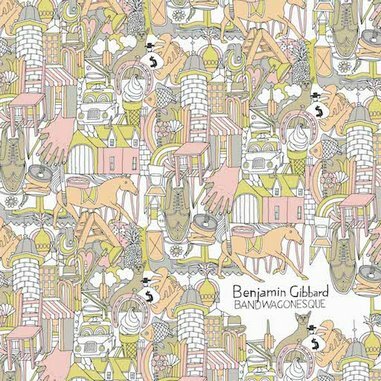 Ben Gibbard of Death Cab for Cutie has recorded and released a full-album cover of Teenage Fanclub’s 1991 classic Bandwagonesque, at the request of a handsome lifestyle website called Turntable Kitchen. Some will snicker, and some will ask why. But aesthetically speaking, it’s hard to see how this could go horribly wrong. Gibbard, after all, is a talented singer and songwriter with a knack for pop-rock music that’s sharper than most. He has been the primary creative force behind a whole bunch of music that ranges in quality from pretty good to life-changing. And he’s a long-avowed super-fan of the Fannies. Bandwagonesque, for its part, is arguably the best album by arguably the best pop-rock band of the past three decades. There are no shortcomings in the material. Thankfully, Gibbard’s homage comes together as beautifully as expected. About half the time, he faithfully covers the originals, lending his honeyed tenor to songs like “December” and “What You Do to Me” and “Alcoholiday.” Gibbard ably handles all vocal harmonies and mixes in just the right balance of guitar fuzz and jangle, and in doing so pays proper respect to these perfect pop nuggets while also giving them a bit of 21st century polish. When Gibbard takes more liberty with arrangements, it’s usually with Bandwagonesque’s less conventional songs. For example, he turns the crunchy, six-minute-long “The Concept” into a sparkling, reverberant space jam, stretching its run time out beyond eight minutes with psychedelic guitar noodling and breathy oohs and aahs. Elegant and airy and beautiful, it’s the sound of Teenage Fanclub colliding with Death Cab’s 2003 epic Transatlanticism. And it is glorious. Elsewhere, Gibbard converts the scratchy guitar riff on “I Don’t Know” into a funky rhythm section, again updating the song in impressive fashion. And “Pet Rock”—a jammy jumble in the Fannies’ hands—becomes a highly stylized Beach Boys-style hymn in tribute. At under 50 seconds long, it’s not a major component of Gibbard’s work, but it does sound great. And that’s what makes Ben Gibbard’s Bandwagonesque such an enjoyable listen. Here’s a skilled guy treating one of his favorite records with the utmost respect, and the results are predictably lovely. They may not be necessary or essential, but they are lovely. And that’s what counts the most.